I was in Dinesh's car along with his wife, Yogita and their kids. We were having a nice time singing songs and chatting along. We stopped for a bit to fill some fuel and got some coffee. I took a little into a separate glass for myself and really enjoyed sipping it in the cold weather that was there at that time amidst the serene, green hills. We started off again. Suddenly, Yogita realised that they had not got their kids' passports! We had driven about two hours from their house. It was 12 noon. If they went back, it would take them four hours just to get to the point we were currently at and then another hour or so to get to the point where we would board the cruise ship. There was panic all round. I got into Kamal Kumar's car and Dinesh and Yogita headed back. There was no way Canadian immigration would allow the kids in without passports! They got in touch with their sister who also stays in Seattle and asked them to break in to their house, pick up the passports and then meet somewhere in between! Dinesh's sister got hold of a locksmith and drove to their house and removed the lock, collected the passports and then met Dinesh somewhere in between Seattle and Vancouver. Dinesh collected the passports and zipped back towards Vancouver! In the meantime, we checked in to the cruise and got on board. We ourselves were late by about half an hour at least. I had given up hope of Dinesh catching the cruise in time. As we boarded, we were asked to attend an emergency drill where we were taught how to wear the life jackets and were told about other mandatory procedures. Chetan had stayed back on the dock to talk to the cruise officials about holding on until Dinesh and his family got there. After the demo, I went to my room and took my luggage inside. I was told that the ship had just started. I was afraid Dinesh might not have made it. I went out of my room and towards the elevators. I suddenly saw Dinesh along with one of his kids. I ran up to him and hugged him tight! I couldn't believe he made it in time! 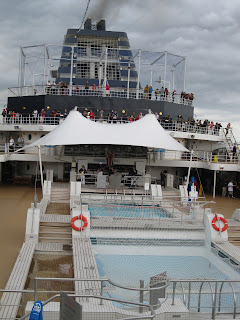 We all then went up to the main deck where almost the whole ship had gathered and there was loud live music playing. The ship had started. We were all so thrilled. Finally what we had all panned for and dreamed about for the last so many months was happening! Glad everyone made it aboard. Look forward to hearing about the rest of the trip. Following your travels with great interest, Kamal! Amazing story. Almost like a thriller movie!! Have a great trip Kamal!